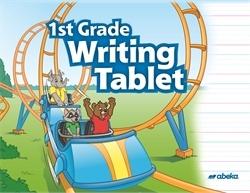 Give your first grader the guides he needs to practice his handwriting consistently with this 144-page writing tablet. Whether he’s learning print or cursive, the pages in this book will aid in the placement and formation of letters, numbers, and the four major punctuation marks. The cursive formation guide is shown in the front on the book; flip the book over and start from that end for the manuscript formation guide. Between the formation guides are lines showing the “upstairs,” “downstairs,” and “basement” to assist in accurate formation as your child practices his writing. Designed for use in penmanship class and for his independent work (called “seatwork” in the Abeka curriculum). Can be used independently or in correlation with the Homeschool Language Arts 1 Curriculum Lesson Plans. Order two or three per child for the year.